Benay: Welcome to another episode of Coach Pep Talk, the podcast for people who run their own coaching businesses. Each week I talk to an expert who shares wisdom that helps us be better coaches and better coaching business owners. This week I’ve got Marc Mawhinney from Natural Born Coaches on the line and he is talking to us about the power of sending daily emails to your email list. So check us out on the other side. Benay: Coach Pep Talk is proudly brought to you by Life Coach Office. Gain ultimate freedom and flexibility in your coaching business with Life Coach Office, the online coaching software specifically designed for the single coach coaching business. You can use the software to manage your client files and coaching resources all in one place online and it’s all under one umbrella with an easy to use technology. If you’d like to give Life Coach Office a try, you can do that for seven days, no credit card required, just an e-mail address. Check out www.lifecoachoffice.com/. 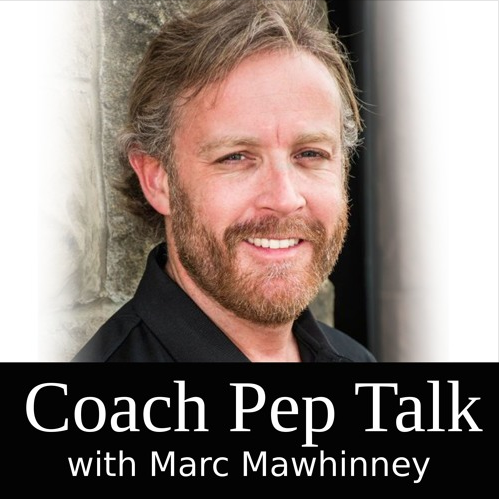 Benay: Today I’d like to welcome Marc Mawhinney to the show of Natural Born Coaches. Marc started out in real estate of all things and went through some serious challenges including business closure that would have caused most people to give up, but fortunately he started working with a coach and got back on track. That actually helped him see the light and the power of coaching and that’s when he decided to go ahead and become a coach himself. He realized that it was actually pretty tough when you’re just starting out as a coach and started a very successful podcast called Natural Born Coaches, which is now over 500 episodes. Through that process Marc learned the ins and outs of what makes a successful coach and particularly how to keep your client list growing. So I’m really happy to have Marc on the show today and he is coming in to share one very specific strategy that he started using about a year ago and that is daily emails. So we’re going to pick his brains all about daily e-mails and figure out if that is a strategy that you should be having in your coaching business too. Benay: Hello Marc and welcome to the show. Marc: Hey Benay, thanks for having me. Benay: It’s awesome to have you on the call today. And I love the topic that you’ve chosen because nobody has kind of talked about this in a lot of detail on my podcast yet, which is the idea of doing your e-mail marketing and emailing your list every day, which some people who might be listening will be thinking like oh my gosh I can never do that, and some are like oh my gosh I’m so excited about doing That. So I’m really looking forward to hearing guess how your whole experience has gone with you is you’ve been doing it for a year now right? Marc: Yeah actually it’s probably 13 months or so, so yeah a little over a year. Benay: Excellent. Okay. So I am looking forward into getting into the weeds and getting into some of the nitty gritty details about how you do these daily e-mails, so for people who want to go down that path it gives them lots of actionable ideas to take away. But for the listeners who may be really new to the space of email marketing, could you just get a at a high level, just briefly explain what email marketing is. So everybody can follow along. Marc: Sure, So when we say email marketing, I don’t mean spam. Thats what some people may think, when they hear daily e-mails, that you just blast your people and sell the crap out of them and sell, sell, sell. And that’s not what I mean. Although there are sales there. But email marketing I mean to be very basic, the way it usually works In my world, I’m in coaching, you and everyone listening is coaching is people sign up for your e-mail lists, they usually go on a bribe, which sounds dirty, but we’ll call it an opt in. They get an opt in, This could be a free report, at PDF, audio series, whatever, they get some sort of gift in exchange for their email address and then they’re on your list and then they essentially give you permission to reach out and talk to them by e-mail. They opted in to it. So that’s essentially what email marketing is. And then you have to of course bring the goods, you’ve got to provide value and connect with them, But the thought is if you do provide that value then you will be getting clients and customers from it. Benay: So that’s really why e-mail marketing is so important. As a client generating tool or lead generating tool. Is that…? Marc: Yeah. I always shake my head when I hear people say here in 2017, oh e-mails dead, you know e-mail marketing is dead. And they’ve been saying that probably for five years or more. But e-mail marketing is not dead at all, in fact since I started the daily e-mails a little over a year ago it completely changed my results from email marketing, which I was getting pretty easy, because I was getting very little results before, when I was doing the once a week, or every two weeks, and kind of like everyone else was doing. And night and day. So if it’s done properly email marketing is not bad, Actually it’s an excellent way to grow your business and I think every coach should be involved in e-mail marketing and e-mailing their list. Benay: How come you feel so strongly about that? Like what’s so important about actually engaging with your e-mail list, your potential customers, your prospects in that modality/medium? Marc: Nowadays people are getting bombarded by social media. They are getting…see How many posts in the run of a minute coming through and between Facebook and Twitter, LinkedIn, and Instagram and all the other ones. And I think that there is something special about your inbox where it’s something a little bit more personal. People see your name come in and they’re not getting, though a lot people are getting plenty of e-mails, don’t get me wrong, but there’s something special when they see Marc or Benay’s name in their inbox. I think that’s a privilege, if you have that right to e-mail them they’ve given you permission to e-mail them that you have to treat that serious and send them good stuff. But I think that it’s different than social media still, and there’s definitely a difference. I’m on a number of e-mail lists and some of them I read daily and I love reading them, I look forward to them, and I learn from them and their excellent. So I take that same approach with my people and interestingly what’s happened since I started daily e-mails is my open rates, for what it’s worth, I don’t think open rates are everything, but my E-mail open rates have gone up significantly. And as mentioned my clients and customers, more and more of those have come in as well. So that’s how… Why I’m such a big fan of daily emails to your, is I’ve seen it worked for me and I’ve seen it work for the clients Im working with. Benay: Yeah just out of curiosity if somebody is thinking I wonder what email lists you actually do follow and read every day. Any one you recommend? Marc: Sure. Yeah. Ben Settle is the person that really got me onto the whole e-mail marketing, the daily email marketing train. So Ben Settle has something called E-mail Players and he’s excellent, he e-mails daily. So that’s Ben Settle said. I follow Ryan Lee, Ryan Lee is with, he’s in Connecticut. He has Freedym, thats freedom with a Y-M at the end. And Ryan does daily e-mails. Oh, who else do I follow? Paul Moore is a fitness guy in the UK, even though I’m not a trainer or anything like that, that I enjoy his e-mails. And there’s probably a handful of other ones that I follow as well. I mean Seth Godin I follow his stuff of course is pretty much just blog copied over to e-mail but you know it’s still daily e-mails of those are a few of them. Benay: That’s great. That’s a great list. Thank you. For people to sort of start and get a feel for how this all comes together and how it works. Can you tell us a little bit about that journey? you touched on it already a little bit, but I don’t know how long ago it was that you actually started using e-marketing in your business. And can you tell us a little bit about that journey towards you know when you decided to switch to daily? Marc: Sure. Well I’m in my fourth year of coaching and I started an e-mail list probably, I don’t know, six months into it or something like that. So a couple of years ago, probably three years ago, I was technically emailing but not regularly or consistently. So I was doing it like most coaches are doing it, where they you know they kind of groan and think well, I’m paying for AWeber, or you know Infusionsoft or whatever, I better put it to use here. So I thought, I’m paying for AWeber, I’ve got to send out the email and my heart wasn’t in it. And I was sending kind of the boring e-mails that everybody sends out. You’re afraid to offend anybody, you’re in that mushy middle. And they just they weren’t a lot of fun to write or probably to read. So, I changed things up when I started the daily e-mails in early 2016. I decided I was just going to take the filter off and I was going to write like I speak and I was going to tell it like it is and just open up you know, and if I offend people and I have people unsubscribing then that’s fine. I’m just not going to worry about it. And you know it didn’t happen right away, I’d say in about a month or so from doing it is where I noticed the big difference. Where I started to get some traction coming from it. And that’s when I started to really believe that, hey this daily email thing works. So when you do daily e-mails there’s a certain way to do it. If you just sound like the home shopping network and you’re sending just you know really spammy promotional stuff all the time then that’s probably not going to work. On the other side of the coin if you’re putting too much pressure on yourself you think your thinking, hey I teach the secret to life and every single e-mail and ask to make sure it’s just really huge thing. I don’t do teaching in my e-mails, you know I’ll give a lesson a business lesson and I think you’re on my list so you’ve probably seen how I write, but I don’t do, yeah I don’t try really hard teaching that’s more for my clients and customers that I do that, but I’ll give a lesson and I give value there but then at the end every single e-mail there is a call to action and it’s not a heavy arm twisting, it’s usually at the bottom. Something that ties into the lesson, I’ll say Oh by the way you know I talk about this in further depth in my print news, because Have a print newsletter, Secret Coach Club, go check out Secret Coach Club, at www.secretcoachclub.com. There is my hidden promotional pitch here I snuck in, so you can edit it out if you want. I call it an action at the bottom, but it’s not a real heavy arm twisting sell. Benay: Yeah you know I think it’s actually really important that you referred to your call to action because it is, I mean I have been reading your e-mails at least for the last month, and some of them are a bit longer, Some of them a bit short, some of them are just three lines and then there’s always that little note at the bottom, but I’ve never found it offensive, well I’m like yeah I just kind of expect it to be there. Of course you wouldn’t be sending me all this great free stuff without you know a little plug for your newsletter. I was just going say as a reader it’s quite fine I feel comfortable and its not pushy. Marc: Well what you try to do is chase the people that you don’t want on there away. So what I call to action does as it chases away anyone who gets triggered by, oh gee look at him selling. You know I I call them the freeple and the cheaple that don’t want to pay anything and I’m sure any of the coaches listening can definitely know what I’m saying here because they are all over the place. And I don’t want those people on there you know, if someone that gets offended that oh Marc put a link to whatever he is promoting then I would rather see them leave. So the way that I always say is I don’t know if this was a big movie and you’re part of the world over here in North America. Clint Eastwood,of course a famous actor, He has a movie Grand Torino That was, I dont know how many years ago, 10 years ago now, and there is a scene in there where he is sitting on his front lawn with with…standing on the front lawn with a gun. Hoodlums or whatever, in Grand Torino and that’s how I kind of view it as I’m standing or sitting in the front lawn with a rifle just chasing people away that I don’t want on there. And you’ll have a lot less stress that way. You have a lot more fun growing your business. Benay: Yeah I think that’s an interesting point to touch on especially when people are just starting out and they see you know that they sent an e-mail out and oh my gosh one person or ten people unsubscribe. Can you talk a little bit about unsubscribes and how you deal with them? Marc: Yeah. Well I’m sure years ago, that used to bug me. I used to To see who unsubscribed and I used to think oh what did I say to offend Johnny or Mary. It’s kind of like Facebook unfriendings. You know, Years ago I used to be the like oh my god so-and-so from high school unfriended me, what did I say and I don’t care too much now. You know it’s kind of silly. So I will give a word of warning if you start daily e-mails at the very beginning you’re going to get probably more unsubscribes then you’re used to, because people are going to be surprised. Their gonna say oh my god, Benay has been emailing once a week now all of a sudden she’s emailing every day, what’s going on. But that’s a really healthy cleansing of your list. It’s kind of like when you do a cleanse for your body, you get the crap out. I hate to say crap, but you know what I mean. If you’re getting the wrong people off your list I think it’s better to have a smaller, more engaged list, than a larger list that’s dead. And what I’m finding now is every day when I send out an e-mail, I get responses from people. And I’m getting business from it and stuff and I never got that before. It was very very rare that I ever got an email back when I was doing inconsistent e-mails. So be prepared that when you start it you will get more unsubscribes, but that’s actually a good thing. I view unsubscribes as a good thing overall. Benay: Its like a detox. Benay: Do you have like a backlog of things that are pre written or can you describe that process a little bit? The actual logistics that go into making it possible for your business? Marc: Yeah well one of the hesitations that people always have when I talk with them about daily e-mails, is they think there is no way that I could not come up with enough content to write daily, what would I am talking about? And once you get into the flow of writing these emails, ideas are all over the place. They are going to come to you when you’re doing your daily chores. They are gonna come to you when you’re watching a movie, or reading a book, or I get a lot of my ideas from media stories actually. And then I tie into a lesson for that day with the e-mail, so i thought I’d mention that because that’s really important that you’re going to be able to come up with the content. You’ll get better at it. Your radar will go up the more that you do it. I don’t overly plan mine. I usually have you know I might have a couple days worth of e-mails where I know what I’m writing. I might start a draft in my e-mail, I use aWeber for my email program, and I might start a draft and tack out a few ideas just to save it. So it’s there. And then if I’m ever stuck the night before the morning of, then I can pull that out. I know you know, what Im gonna write, but your know I dont like to have 30 days sequences worked out all that stuff, I like to keep it fresh. And another important point is, I think it’s important to be consistent with when you send them out. So my e-mails go out daily at seven thirty a.m. Eastern time. And then there’s times when I’m promoting something a little bit heavier. If I’m getting close to the monthly deadline for my print newsletter. I’ll send out two e-mails a day, I’ll send out one at 7:30a.m. Eastern, and then 7:30, Another 12 hours later, 7:30p.m.. So I’ll send that one in the morning and one at night. Benay: So you actually sent two different e-mails on that day? Benay: Go ahead…you always find? Benay: Yeah, So can you tell us a little bit about because there probably are people listening, that would be like You know like, oh my gosh that’s, you know that would just be like I’m spamming somebody. How do you … what’s the theory behind that and what kind of results have you noticed as a result from having applied that? Marc: Well you have to remember that people are seeing all of your e-mails. You know people might be missing that one earlier in the day. They have a busy day. They don’t check their e-mails or they fly through it or whatever. When you build up a relationship and people know, like, and trust you, and they actually look forward to reading your daily e-mails, there’s absolutely no issue with sending them two or three a day. So I used Ben Settles as an example, I talked about him earlier, Ben was really important with what I’m doing with e-mail marketing and Ben will somedays send out three or four. Now he revels in getting unsubscribes. He wants to chase people away because… He’s very open about it he doesn’t want certain people in his world or on his list. So that’s his way of vetting people out. But I don’t get offended when Ben’s going through some sort of promotion, he sends a couple e-mails out, because they’re entertaining e-mails and that goes back to the whole don’t be boring thing. If you’re sending out boring stuff that you’re trying not to offend and it’s just it’s bland and dull. Then people could get annoyed with three or four e-mails. But if you’re sending out ones where you’re interesting, or you’re funny, and you’re something that they’re looking forward to, they’re not going to worry about a couple e-mails a day. you know if fact they’re going to read all them and that’s probably going to buy from you. Benay: What do they end up buying? Do you have a couple of things or is it always targeted towards one thing? Marc: Well anyone on my list will see the one I’m usually promoting is that print newsletter, because that’s a really… I launched it back in March of this year and it’s a really important part of what I’m doing. So I’m really keen and pumped up about that newsletter. So most days people on my list will see that. It will be the Secret Coach Club that will be promoted, but I do some other things. My e-mail today was promoting a joint webinar I’m doing tomorrow night with someone that’s that I’ve been connected with from my Facebook group and that’s what I talked about today. You know I’ve been promoting, I’m running a couple group programs of five coaches each, so I had to fill 10 spots, I had two different programs going. I filled all 10 spots, Most were from my e-mail list, I believe eight or nine of the people were in my email, on my email list. Which is really important so it helps fill my group spot. So I’ll promote group programs. I could promote if I’m looking to fill a couple discovery calls for the week, I’ve got a couple spots, maybe I’ll promote that. but For the most part it’s my print newsletter. And really there’s no right answer there. You can promote the things. My print newsletters ninety seven dollars a month, you could do that, or you know my one on one coaching is 6K. sometimes Ill promote that, which is pretty broad range but it really depends very much on your business? Benay: Does anybody help you when you are sending out these emails or are you doing this for yourself ? Setting it, writing it, sending it in AWeber? Marc: Yeah yeah I’m writing it myself. I don’t really want to get too much help because I don’t want it to be in someone else’s voice other than my own. So everything I write it is myself, now that being said, my girlfriend I might bounce something off her like, Hey I’m sending this out of my e-mail tomorrow do you think that’s a little too much? Or if I’m telling a story about us, I want to make sure it don’t say anything I shouldn’t be saying. Hey you know it’s okay to mention this story and you know she has give me recommendations like hey you know maybe tweak this or whatever, but I don’t show every e-mail. She’s on my list so she’ll read them. But I do occasional ideas off her with it, but I think it’s important to write like you speak and I’ve had people on my list that know me in real life and they say I’ll Marc your e-mail sounds exactly like you. and Im like well that’s because it’s me writing them. Benay: Yeah. And what about the. So do you jump into AWeber and do all that fiddling around, too. I mean it’s pretty easy, but, Or do you hand that on to somebody? Marc: I like to keep a very tight rein on my AWeber. Same thing with my Facebook. I don’t have any VA’s or anything doing any of my posts. I know some people hire out people to create content for them and I think that’s a wrong move. I think you come across as fake and you know it just doesn’t sound like you. Yeah I’ve had VA’s handle things by per project basis. I would never want somebody writing my e-mails for me. And even when it comes to the tech side you know, Aweber is very easy to use. You know once you send out a few you’re going to be a pro at it. Now that being said I’ve been tempted to switch to Infusionsoft at times which is called confusionsoft probably for a reason. So if I switch to Infusionsoft I probably will feel a little bit of help there but AWeber is very easy and the other ones too like MailChimp and ConstantContact, I mean they’re all pretty user friendly. Benay: Yeah I started out on AWeber and moved to Active Campaign. I’m still not sure that was the right move or not, but yeah they’re all really easy to use once you get your head around the basic model. So let’s see if we’ve got a new coach who is just starting out and they’re listening to this show and they’re thinking okay, wow, so I need to just jump in and start writing daily e-mails, I got 10 people on my list. Do you think that’s a good decision? Would you give them different advice? Marc: I don’t know about this word, should I change that, and I’ve always been a fan of that same way with Facebook posts. Perfect example about this, I had a really it wasn’t them earth shattering thought a couple days ago, but just whipped my iPhone and I posted it. And the thing went, Now it’s a viral, viral for my post did, it’s not like it was like the Chewbacca mum with the video you know for Facebook live, that went viral that way. But it got a ton of likes, it got hundreds of likes and a bunch of shares and all that stuff. It took me about 10 seconds on my phone, I just whipped out the phone, posted it and then I forgot about it. And that’s the best way to do it. When an idea is fresh in your mind, open up your AWeber for e-mails and just get it out there, you know. Don’t overthink it. and I will say it’ll get easier the more that you write the e-mails. So when I first started doing the emails it took me probably close to an hour to write an email, because I was probably overthinking it too much. Now you know 10 15 minutes I can pound out an e-mail, I test the link, and then it gets sent out. So as you write more and more them you’ll become a better writer and it’s held my other writing too, which is an interesting sort of side benefit. It’s helped my writing for my other social media. I’m working on a book at the moment, it’s helped my writing there as well. Benay: You’re writing these daily e-mails, you’re working on a book, you’re doing coaching, you’re writing a newsletter. How much time during the week do you actually spend on writing? Oh and do you blog on top of that as well? Marc: Well Im actually glad you ask a question because it brings up an important point. With my daily e-mails they get copied over to my blog and when I first heard that advice who was actually Ben Settle who gave the advice, I thought well that’s kind of a stupid idea because who’s going to subscribe to your e-mail if they could just go to your blog. But what I found is it actually gets more people on your e-mail list because for various reasons you know you could share it on social media. People get to the blogs when they sign up. You know people don’t want to go into the website everyday, they want to get delivered directly to the inbox. so I think you should copy your daily emails over to a blog as well which sounds counter productive but it’s actually it does work. So that’s what I do. That’s an interesting question how often do I write. I haven’t broken it down you know. I write a lot in the morning when Im fresh, and then I start to set aside certain days where I’m no calls and when I write. If I had to break it down I would say probably I dont know, 20 hours a week, in that range, 15 hours of heavy concentrated writing. It would probably a little more if I factored in social media powers and stuff like that but you know my e-mails are probably at I don’t know like, All told five hours a week for everything and then the book I’m writing close to an hour a day for that as well so I would say in 15 to 20 hours. Benay: That’s quite a lot. And how long is your work week? How many hours total? Benay: I put that in my training bucket personally and that doesn’t count as work hours. Marc: I know exactly, I’ve changed because my backgrounds actually in real estate. I was in real estate for a decade through my twenties and I used to work anywhere from 80 to 100 hours a week and I think I carried over a lot of those workaholic tendencies here to coaching and it’s been a battle to sort of change that because I had this guilt that I felt like if I’m not pounding the pavement, you know making a bunch of calls and doing virtual meetings and stuff like that that hey I’m a loser. I’m not working and that just makes you kind of you know that not a…thats a stressful way to run your business. So I’ve gotten better now at I’m saying no, I’m not going to feel guilty, not going to check Facebook, and I’m going to read a book. Or I’m going to write or I’m going to do something like that, relax. So I really don’t know how to answer that question if I had to guess I’d say maybe I mean around 50 hours a week of actual work but it doesn’t feel like work on the other stuff. Is this work? I mean it’s eight thirty in the morning here my time and it doesnt feel like work but other people might say that it’s work. So I don’t know. Benay: There’s a fine line as kind but that gives us it gives us a range to work within so that’s good. Benay: If there was one piece of advice that you would like the listeners for today to take away, that’s something they could action in their own coaching business, what would that be? Or what is that? Marc: Start daily e-mails I guess, obviously. Marc: Yeah, Anyone who listens to this, I would besides starting daily e-mails over all the coaching world, I would say bump your prices up and odds are people listening that their prices are too low even if they don’t feel it and there’s probably room to bump that up. So it can be scary to do that. I went through about a year and a half ago I doubled…my fees are already pretty high compared to the industry average, and I said you know what, screw it I’m going to double my fees and it was scary and I wondered if I’d be living in a cardboard box under a bridge somewhere. But luckily everything worked out so I would say challenge yourself and get those fees up, it’s better for you obviously but it’s better for the client as well. You’ll get better results and its win win. Benay: Ok, just out of curiosity what were your fees and then why did you double, what did you bump them up to? Marc: Well I guess I’ll give you the Cliff’s Notes version for the story here just so i don’t bore everybody with the long story . But getting towards the end of 2015, my one on one fees for my three month package were three grand US. So I was right around a thousand dollars a month it worked out too, which was you know pretty good compared industry averages, but I’d done a Virtual Summit, I hosted where I had 21 experts on and it was called the Command Higher Coaching Fee Summit. So I spent all this time interviewing people, I kept talking about the need to increase your fees and I said you know what I’m a real hypocrite if I don’t increase my fees after doing so many interviews for the summit, and instead of doing sort of a little, you know first of all do I bump them up from 3000 to 4000 or forty five hundred? And I said oh you know what I said you know what let’s just double them and push ahead with it. and It was scary you know to do it, but I just said you know I’m not going to overthink it. I’m gonna make a change. and that was about a year and a half ago and I don’t regret it. So I would say challenge yourself with those fees and I hate to see coaches working for free or peanuts. You know I saw, I was talking to coach the other day who’s charging a couple hundred dollars a month it works out to for one on one, You know and you shouldn’t be coaching for 250 dollars a month. You know that’s just way too low. So definitely get those fees up so. Benay: Ok, good advice. Hopefully that that story has inspired people to take action on their fees and also to consider writing daily emails. Benay: Everybody’s gulping. Okay, before they start how many should they have prepared, or should they just jump in and say I’m going to write one today and Im gonna write one tomorrow? Marc: Yeah I would jot down when you start I don’t know like a week’s worth of just titles, don’t have a full e-mail worked out, maybe you write out a title and a few notes to jog your memory. Then did this get started right away with the first one so, if it makes you feel better to have a couple in the can, you know write down two or three e-mails. But you know what I always find funny is nowadays people work on these like long, complicated 30 email sequences. You know kind of onboarding sequences, where they want to nurture the relationship when someone starts and I actually heard terrible advice a while back and I think I’ve talked some sense into the coach, but she had, some guru had recommended that she not sell it until at least 50 emails. So she said he was telling her that she should send 50 emails before she even makes any mention that she’s in business and selling anything, which is just horrible advice. You know if you’re in business and you should be telling people what you do and I think you’re waiting too long. It’s an issue a lot of coaches have, they pretend that they’re not in business, they don’t want to come across as salesy. So you know heaven forbid if anybody knows that you’re in business and she’s actually changed her ways now. we’ve had a brief conversation about it. There are people out there saying that, oh you’re going to build relationships, and don’t sell for 50 emails. Don’t do that, just start selling day one and sell every day but do it the right way, you know make sure that it’s not spammy and over promotional. There’s a right way and a wrong way to do it. Benay: Yeah well that’s a great segue because I mean I think you do it very beautifully in your e-mail sequence. If somebody wants to jump onto your daily e-mails, How can they do that? Marc: You have the best place is go to naturalborncoaches.com and they’ll get my free book, It’s called ‘The Real ABC’s of a Successful Coaching Business’, and then they can kind of have a look and see how I send my e-mails and that will give them an idea of the flavor, but write it in your own voice. Thats what people want to hear about, you know I’m Canadian, I’ve got kind of quirkie, my son was say a lame sense of humour. I use puns and stupid jokes and things like that and sometimes I have a bit of a potty mouth or whatever. But your style may be different you know and just write the same way that you speak and you’ll be okay. Benay: Yeah. And just a note on your freebie, that is a brilliant freebie and I think it really gives people a lot of insight into your personality and where you stand on all these sort of main concepts in the industry so it’s really it’s really well done. Benay: You’re welcome. Okay, listeners who should go and get that freebie and get on this list, especially if you’re thinking about going and starting your daily e-mails because it’s a really good example of what you can do and how I guess how natural it can come off. All right Marc I’d like to thank you very much for starting your day with me on this show. Marc: Yeah well thank you Benay and congrats on the podcast. I love what you’re doing. So keep it up. Benay: Thank you so much and thank you visitors for listening too. And you can always help us out by going and liking the show on iTunes. Have a great day everyone. And happy coaching.